​Borussia Dortmund winger Jadon Sancho has admitted that he wants to stay at the club for the foreseeable future, despite rumours linking him with a return to Manchester City. After leaving Pep Guardiola's side in 2017, Sancho has emerged as one of the world's hottest prospects and has been pivotal to Dortmund's rise to the top of the Bundesliga. His tally of seven goals and ten assists has reportedly attracted interest from many of Europe's biggest clubs, with a monumental return to City regularly suggested. 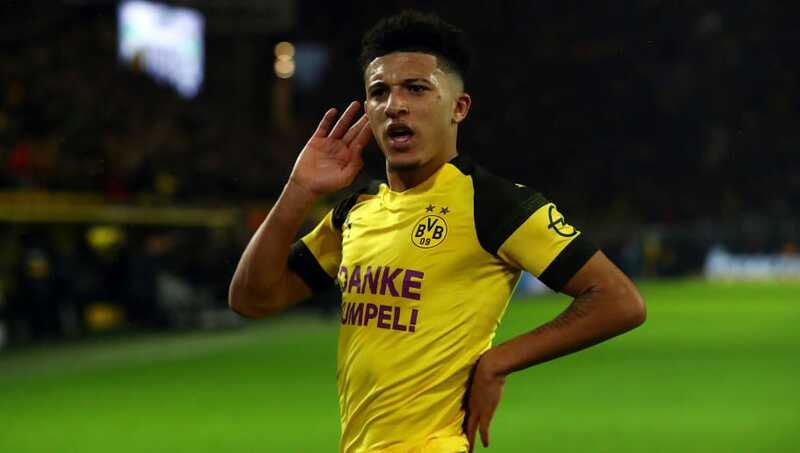 However, when asked by reporters whether he planned on remaining with ​Dortmund, Sancho insisted that there is no good reason for him to leave the ​Bundesliga leaders. He said, as quoted by the Daily Mail: "I will. I just want to play football and I'm getting that opportunity here. I'm happy right now. "[The language barrier] worried me quite a lot, but when I came and everyone started speaking English I got more comfortable. My German isn't the best but I'm learning, I have to learn. "I've adapted really well. Obviously when I first came it was a bit difficult because I'm not around the corner from my house. But my family have helped me with that – and the club also. "Going abroad wasn't really a big deal. Since I was young I've always been away from home so I was comfortable. I thought 'why not Germany?' and look what's happened now. "There were some people that said they weren't really sure because it's a big step moving away from home and everyone that I'm close to but I think it's worked out really well." His electric form since leaving the ​Premier League has turned Sancho into somewhat of a poster boy for young English players. ​Arsenal youngster Reiss Nelson has followed in Sancho's footsteps with a loan move to Hoffenheim, whilst ​Chelsea wonderkid Callum Hudson-Odoi is currently subject of multiple bids from Bayern Munich.